Total conversion of each machine to vend 16 and 20 ounce bottles. NOTE: Mouse over the machine for cabinet's interior view. New Decals & Displays: Re-decal the sides of the machine and install new display. Cabinet Painting & Touch-ups: entire exterior cabinet and door, along with repairing any holes or small dents. Refurbish the refrigeration unit. This includes a new R12 compressor and filter / dryer. Repair refrigeration unit. This includes repairing any leaks and replacing the condenser fan if it is required. 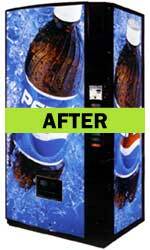 We also refurbish and repair SNACK, FOOD, and COFFEE Machines. Call for a quote! Have we talked to you previously about a different price on a service or upgrade? Use the Buy Now button below to make payment. +Interior cabinet width must be approx. 34.5"